There are plenty of fish in the sea, and there are almost as many places you can find seafood, from the grocer’s freezer to five-star restaurants. As Florida’s largest distributor of fresh and frozen seafood, North Star Seafood’s claim to fame is being able to serve virtually every market segment for seafood and do so with the same level of quality and care. COO Josh Burman says North Star Seafood has made its name by serving the broadest customer base in the region, ranging from high-end hotels, white tablecloth restaurants and cruise lines to big-box stores and independent retailers. “What makes us really unique compared to many other businesses is we operate on all levels,” Burman says. Founded in 1992, North Star Seafood was the brainchild of Burman’s father, Rick, who for many years built his career sourcing and distributing all types of seafood to high-end chefs and restaurants in New York City. After moving to Florida, he established North Star Seafood and began applying the lessons he learned in New York to the Florida seafood market. In time, the company built up a series of strong relationships with suppliers and customers, eventually becoming the largest seafood distributor in the state. Today, North Star Seafood operates more than 60,000 square feet of HACCP-certified space, along with a fleet of 40 refrigerated trucks. The company has three facilities, one of which is SQF Level 2 Certified, and all exceed FDA, USDC, USDA and GMP standards, . Even though the company already has the largest operations in the state, Burman says North Star Seafood still has room to grow, and its devotion to doing things the right way no matter who its customer is will be the driving force behind that growth in the near future. With such a broad range of customers and the widest selection of products on the market, North Star Seafood has to be vigilant in assuring customers that its products are of the highest possible quality. Burman says one of the primary reasons for the company’s success over the years has been its ability to focus on what it needs to do to deliver the highest-quality products with the highest-quality customer service each and every day. Even though North Star Seafood is large enough to have significant buying power, that doesn’t mean it can’t focus on the tiniest details for its customers. “We’re constantly striving to be perfect every single day,” Burman says. The company’s customers-first philosophy means its management is hands-on and is constantly striving to attain the highest levels of quality and service every day. Burman says the level of attention to detail the company offers all of its customers means North Star Seafood operates more like a small company despite its size. “We’re able to give all of our customers the attention they really need,” he says. That attention to detail can be seen throughout the company’s three processing facilities. With three large freezers and 10 coolers, the company says it does not have to rely on outside storage, keeping its supply chain under greater control and ensuring high-quality products. 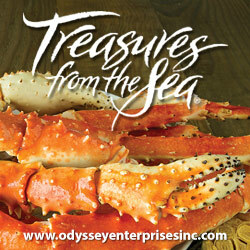 One of its facilities is close to Miami International Airport, giving it better access to the freshest seafood possible. The company says it prides itself on being able to reach any part of Florida in a single day. North Star Seafood sources seafood from more than 300 suppliers, and it continues to add some of the best and highest-quality products available. For example, the company recently entered a partnership with Skuna Bay, a supplier of high-quality salmon based on Vancouver Island in British Columbia. Burman says Skuna Bay is very particular about the distributor it chooses for each region, so being selected to distribute its salmon is an honor for North Star Seafood. Known for its fourteen-point inspection program for each fish, Schooner Bay salmon is sealed as soon as it is prepared and not opened until it reaches the chef. Like many of its suppliers, North Star Seafood is concerned about overfishing, and it has taken numerous steps to ensure that it operates in a manner that concentrates on sustainability. The company has partnered with the Centre for Development & Sustainable Fisheries – Latin America & Caribbean, a nonprofit that focuses on helping fisheries in Latin America and the Caribbean achieve sustainability. In recent months, North Star Seafood has partnered with another nonprofit, the Sustainable Fisheries Partnership (SFP). Burman says the company is the first seafood distributor in the area to join SFP, which helps seafood companies develop fishery improvement projects that encourage greater corporate responsibility when it comes to sustainability. Burman explains that such programs are vital for the continued success of the seafood industry as well as the health of the oceans’ ecosystems. “The demand for seafood seems to continue to rise, and the supply in many cases just isn’t where it used to be, which is why we feel strongly about the sustainability initiative,” Burman says. Sustainability is a major point of emphasis for North Star Seafood going into the future, but it’s not the only thing the company sees on the horizon. Burman says the company expects to continue expanding to more markets within Florida, including markets such as Orlando and Tampa where the company does not yet have as strong of a presence. One significant area of growth Burman sees in the company’s future is in serving cruise ship lines. As it adds more fresh seafood programs for those customers and develops stronger relationships in the industry, North Star Seafood expects to see a lot of growth there. “It’s really going to be a boost for business for us,” Burman says.